During an inquest into the March 30, 1930 death of Gladys Anderson, an 18-year-old freshman at the University of Illinois, word came that Cleo Hinton, a 24-year-old stenographer, had also died from a botched abortion. Both deaths were linked to Dr. Thomas Eade. On March 31, 1891, a sickly young woman boarded a train out of San Fransciso, aided by a dapper middle-aged man with enormous muttonchop whiskers. Soon after boarding the train, the young woman fainted. One passenger on the train indicated that the young woman was unresponsive and that her eyes were rolling wildly. At Benicia, California, fellow passenger James Riley helped the young woman to leave the train and get into a carriage. She died in the carriage just a few minutes later. Her body was taken directly to the morgue for examination. Investigators found letters in her possession signed by locomotive fireman John "Jack" McCarville. The letters indicated a romantic attachment, but didn't indicate any intimate involvement between McCarville and the woman, who was identified as 18-year-old Ida Shaddock of Colusa, California. The man who put her on the train was eventually identified as Dr. Samuel Hall. Dr. H. Janeway, who had been a passenger on the train, observed the autopsy on Ida's body. The physicians found massive infection and damage from a sharp instrument used to perpetrate an abortion. The injuries were so extensive, and in such a location in her body, that Dr. Janeway and other physicians including Dr. Edward Gray said that it was highly improbable if not impossible that Ida could have caused them herself. The San Francisco Call noted in coverage of the doctors' testimony that "A day before her death it would have been impossible for her to have left her bed of her own will, and her removal hastened teh end at least twenty-four hours and must have caused her untold agony. The slightest motion would have given her excruciating pain. Gangrene set in three days before her death." Dr. Samuel Hall was arrested and charged with murder in her death. At first he admitted that she'd given birth to a stillborn child at his house, but denied any criminal culpability in her death. Then he admitted that he had performed an operation on her less than a week prior to her death. 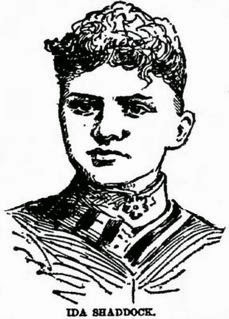 Hall was tried twice for murder in Ida's death. The first trial ended in an evenly split hung jury after twenty-two hours of deliberations. The second, three years after Ida's death, ended in an acquittal after the jury had deliberated for four hours. Hall had obtained over sixty continuances between the two trials, and during that time many key witnesses had moved away or died.